Among the Sleep succeeds at being a creepy baby simulator, but the real monster turns out to be boring, buggy puzzles and a shallow world and story. Being a baby is weird. My mom keeps jamming her nose in my face to tell me things I can't possibly understand, and the most I can do in response is bobble my head around and paw at the space in front of me. When I'm freed from her totalitarian affection, my bowed little legs toddle alongside the shadow of an oversized head, awkwardly navigating a world designed for people who are much bigger than I am. And then an ugly little teddy bear starts talking to me. Maybe this is why we don't remember early childhood. Among the Sleep's pitch, which earned it over $200,000 on Kickstarter last year, was that a horror adventure game in which you play as a two-year-old would be really cool and really terrifying. The backers should be pleased that it succeeds on both accounts—it's a cool idea, and it's scary—but everyone else should be cautioned that it only succeeds at those things. As the wobbly little protagonist, I'm strong and agile enough to push boxes and chairs, open drawers and doors, climb up ledges, use colorful shapes as keys, and limply toss a ball. I can walk, but crawling is faster. It's really weird, and as effective as it sounds at making me feel vulnerable in a horror setting. As I explore my house—first to find the talking teddy bear, who was stolen by an invisible force in the night, then to look for my mom—the biggest threat is the sound design, which creaks and gnashes out of every blindspot, expertly unsettling me despite some noticeable looping. The puzzles, on the other hand, only threatened me with boredom. From start to finish, the only challenge to Among the Sleep comes from light arguments with physics: trying to get a drawer to open instead of shut or hammering the space bar to convince the game that I can climb onto the thing I know I can definitely climb onto . One part was totally bugged for me: a platform that was supposed to move got stuck and jittered around, amusingly launching me into the air when I stood on it. Once I figured out that the trampoline wasn't intentional, I had to reload the last checkpoint, which was mercifully only moments behind where I was. When the monster is introduced—there is a monster, and it can get you—there's some seriously tense crawling for your life. It's scary, creepy, and the best part of the game, even though I didn't even realize it could kill me until near the end (“kill” as in “fail”—nothing graphic happens to a baby). That's some pretty commendable horror design: I find games scariest when I'm constantly close to being caught instead of actually being caught, because actually being caught reduces the threat to reloading at a checkpoint. Like the puzzles though, the monster never challenges: both are primarily a reason to keep you waddling through Among the Sleep's increasingly mangled environments. After the introduction, your normally terrifying house becomes a fantastically terrifying house, with shades of American McGee's Alice. Bits of home hardware—a wall lamp, a coat rack—stick out at odd angles in a foggy playground, a gnarled forest, and a version of home that's been twisted into a demonic funhouse. It's a joy to look at, especially in the beginning, when shafts of moonlight and dim lamps just barely fail to illuminate something hideous, casting fear in every direction. Beyond a cursory inspection, though, the quality of the props is inconsistent: a grandfather clock looks great, while a nearby drawer is filled with a blob of clothing texture. And most of the props are meaningless, making the world as shallow as it is threatening. The whole purpose of exploring this toddler's mind is to identify the horror attacking him, but there's nothing much to find in his head. Gone Home succeeded as a story exploration game by giving meaning to every object and its placement, making us do most of the work to decipher the history of its family. I might have forgiven Among the Sleep's bland puzzles if they lived in the background of a rich environmental story, but the only clues here are crayon drawings we have to assume this absurdly talented two-year-old created and a few recurring objects that are so on-the-nose it hurts. Every other drawer, box, closet, and corner is either empty or cluttered with generic props. 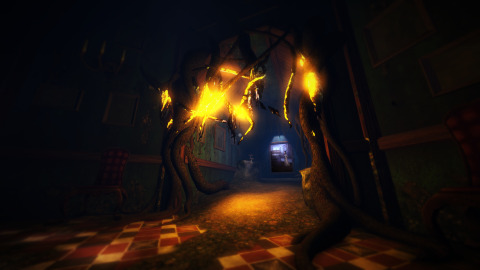 With a shallow story, no interesting puzzles, and no reason to poke around the meaning-devoid world except to solve those uninteresting puzzles, Among the Sleep only accomplishes the minimum of its pitch: being a baby is weird, unsettling, and makes for some very effective scares in a fantasy horror setting. I do love the concept, and the monster encounters, sound design, and environments are great, but I can't recommend a $20/£15 game with so little substance. In the unlikely case that you own an Oculus Rift Development Kit, it's natively supported, and a better way to play a three hour game that derives most of its value from atmosphere.